Evenement duurt erg lang: 7 dagen! 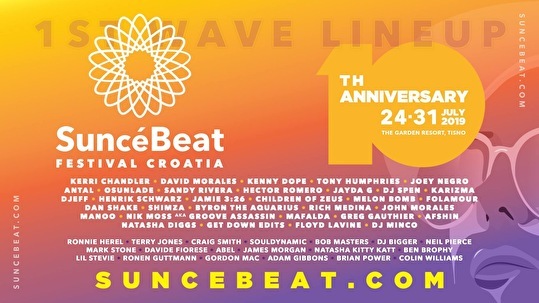 Suncebeat 10 will be off the scale if this year is anything thing to go on, expect the best in artists from throughout the world bringing all blends of soulful music, from Soulful House, Soul, Disco, Funk, RnB, Boogie, DnB, UK Garage, Afro House, Reggae, you name it we have it. To think we’ve had nine fantastic years in Croatia already is pretty amazing, and we’d like to take this moment to thank you wholeheartedly for co-creating the most beautiful event we have ever been involved with in our many years promoting the music we love so much. Whether it’s afternoon pints of Karlo in the picturesque town of Tisno, fruit-filled cocktails next to the sea bathing in the sounds of the beach stage, or dancing under the stars until the sun comes up at Barbarella’s, there are memories for life to be made at every turn at this one-of-a-kind gathering of the worldwide soul music family. * On site Apartments will be on sale from 11:00am UK Time on Friday 3rd August and it looks like these will all be sold out very quickly but Airstreams, tents & AC Cabins will follows on sale not too long after these sell out.